2. Eight racers took an insane free fall at the Batoka Gorge. When teams arrived at the Lookout Cafe, which commanded a view of the Zambezi River, they were each asked, "Who wants to gorge themselves?" One member of every team had to swing between the rocky cliffs at the Batoka Gorge, basically putting their lives at risk for the next clue. Justin (#TheGreenTeam) was first to take the heart-thumping drop which catapulted him into a 200-foot free fall and screams echoed within the gorge as other teams watched on before it was their turn. When #TeamTexas was up, Josh jokingly complained to Tanner, "You got to tango on a three-foot wall. 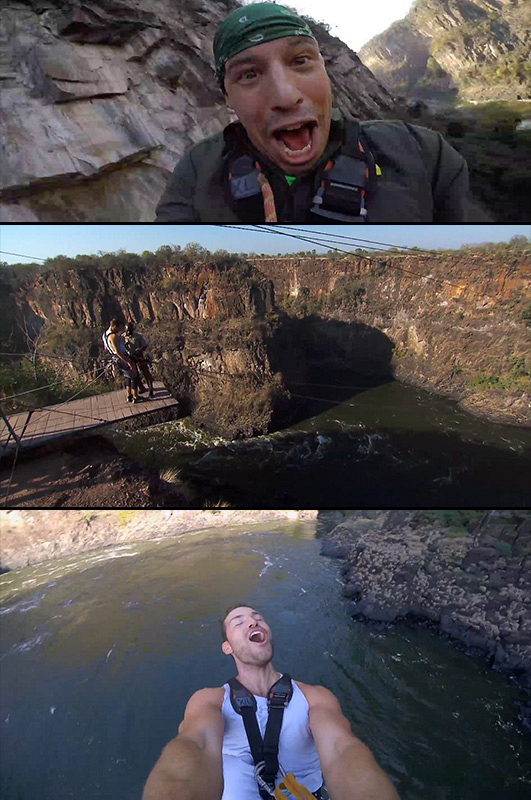 I’m about to jump off a 200-foot cliff."